With the duty of becoming the eurozone’s banking stability supervisor looming, 2014 looks set to be another busy year for the European Central Bank. When the Single Supervisory Mechanism (SSM) comes into force in November, the ECB will assume all the pressures of such a massive role – pressures that ECB President Mario Draghi says are “a real step forward in setting up a banking union” and will lead to a “restoration of confidence in the banking sector”. While the true efficacy or, indeed, practical power of the SSM will emerge in the coming months and years, the ECB also has their sights set on another matter – finally resolving the not-so-small issue of a new home. With the laying of the foundation stone in May 2010 construction commenced after years of preparation. The stone was symbolically filled with newspapers from all of the EU’s then-27 member states, a copy of the building plans, and a set of euro coins and banknotes. The high-rise project is now rapidly approaching completion after being topped out in September 2012. Construction company Ed. Züblin AG undertook the main structural work, with board member Klaus Pöllath promising at the topping out ceremony that the result would be an “icon for the city of Frankfurt”. Later this year, the ECB will take up residence at the completed headquarters in Frankfurt’s reinvigorated Ostend district. 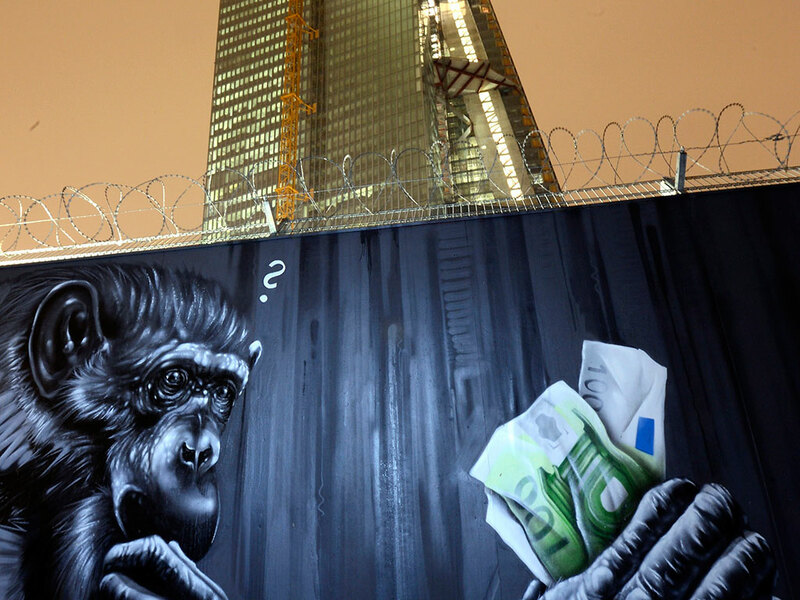 Currently, the ECB is predominantly based in the Eurotower, famous for the iconic euro symbol that sits outside the building. It also rents offices in two more buildings because of a shortfall of office space in the Eurotower itself. 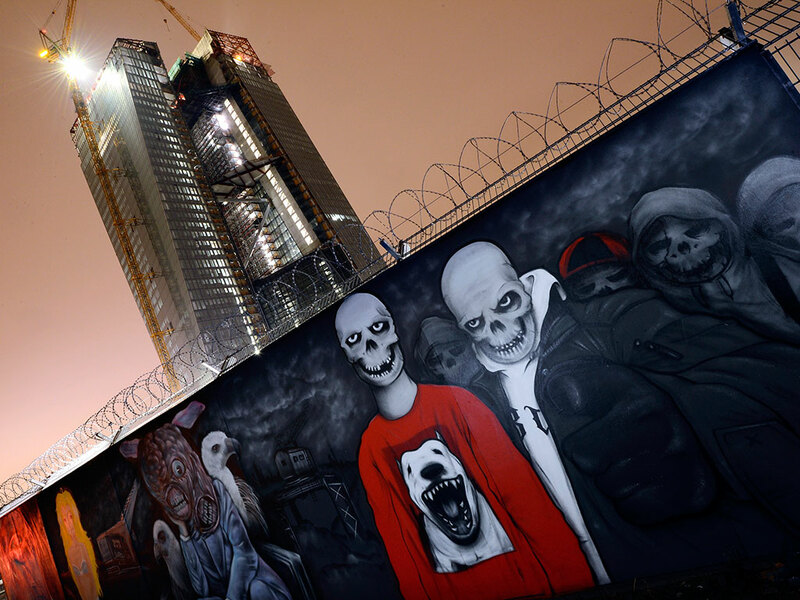 Ever since the date of its creation in 1998, the ECB has been searching for a home of its own away from the Bankenviertel, the city’s busy financial hub. When they signed the contract to buy a large swath of land by the River Main – and the city’s former wholesale fruit and vegetable market, the Großmarkthalle – in 2002, they scarcely could have expected that their new home would take this long to rise into the skies of continental Europe’s most important financial centre. Nor, it seems, could they have anticipated the final costs of the undertaking. At a total cost of as much as €1.2bn, almost €350m over budget, the ECB’s new headquarters are turning into quite the expense for the organisation. The overspend was mainly caused by increases in construction material costs since the commencement of the project and unanticipated structural problems that initial examinations failed to detect in the Großmarkthalle. The foundations of the 1928 heritage building were found to be insufficient for the project’s demands and required significant work to replace. The ECB was also forced to reconsider disposal plans for the roof coverage after it was found to be contaminated. The project has been bogged down by other complications. In 2008, the first tendering procedure for a general contractor was closed after the ECB decided it did not produce a satisfactory economic result. A second tendering procedure was proposed soon after, with a new contractor model: the construction works would be divided up into packages, in the hopes that medium-sized businesses would be able to produce competitive tenders, and also so that specialised companies could be found from each trade to complete the required work. Funding for the project has mainly come from the ECB’s profits on investment earnings and interest payments, and no additional funding was required from EU member states to complete the project. Vienna-based architects Coop Himmelblau won the competition to design the new headquarters soon after it was announced in 1999, and they have designed a striking and modern headquarters. The ‘double-tower’ design stretches to 185m and connects two separate office towers with a glass atrium to create an informal meeting space between them. The new construction will also be incorporated with the Großmarkthalle in a way that preserves most of the building’s famous brick exterior, with the inside being dedicated predominantly to conference space and a visitor centre. There has also been special consideration paid to the building’s long history, including a memorial to its local role as a collection point for the deportation of Jewish men, women and children during the Holocaust. Time and effort has also been spent in making the building environmentally conscious. Rainwater recycling, low energy lighting and natural ventilation, as well as an ambitious ‘envisaged utilisation’ of geothermal energy being used for cooling and heating, will all help to keep the structure sustainable and keep costs down. The bank says the design is flexible and will suit most of its needs, but acknowledges that some 1,000 staff members – the supervisory staff required to manage and maintain the SSM – will have to remain in the Eurotower. This is a big blow for the institution, which has long sought to bring all their staff under one roof and means that they will have to continue to rent the Eurotower for the foreseeable future. The decision to continue their tenancy at the Eurotower, and not to relocate elsewhere, was because it could “meet the logistical and operational requirements” of the organisation. Furthermore, there are currently no plans to build on the new site to house the extra personnel. 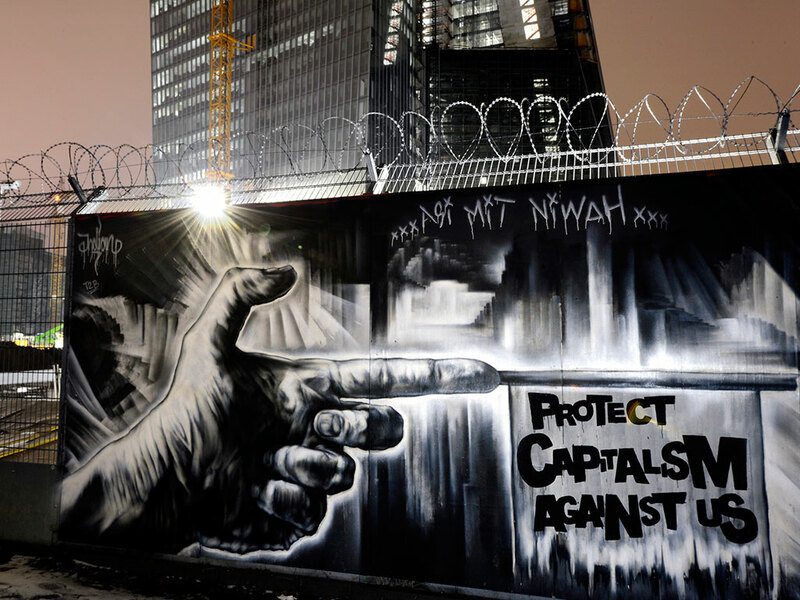 Although it is unlikely that the ECB could ever have predicted the exact nature of its increasingly important role in the eurozone, the planned arrangement will leave a bitter taste in the mouths of some who would have expected the eurozone’s central bank to have future-proofed more, especially with the protracted length of the project. Final preparations to complete the move are already underway, despite the problems. Late last year arrangements were being made to oversee the transfer of the ECB’s equipment to the new site, including some 3,000 workstations, 500 art exhibits and over 7,500 bottles from the organisation’s drinks cellar. With any luck, before 2015, the ECB will be settled into their new home, and from there will be able to keep a weather eye on maintaining the stability of the eurozone’s most important banks. 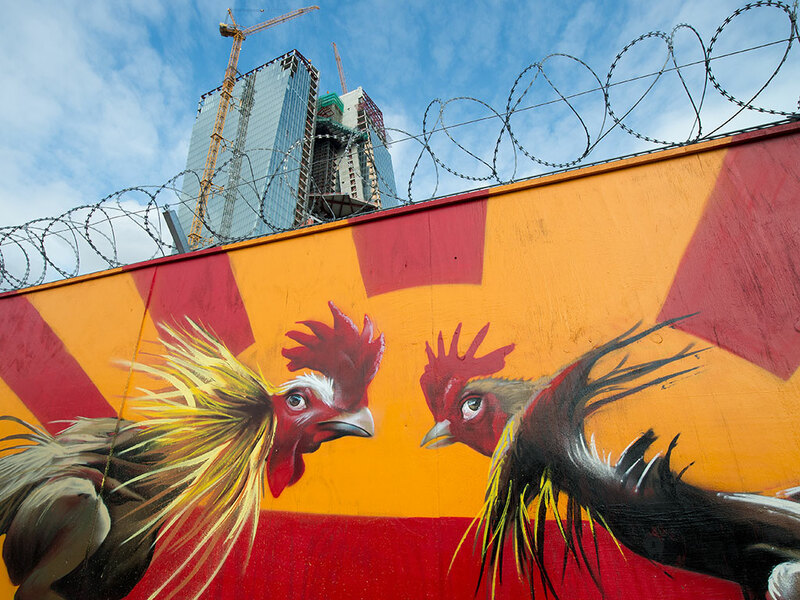 The ECB construction site has become an unlikely tourist destination for young artists, with many having flocked to Frankfurt from all over the world to create socio-political graffiti murals. 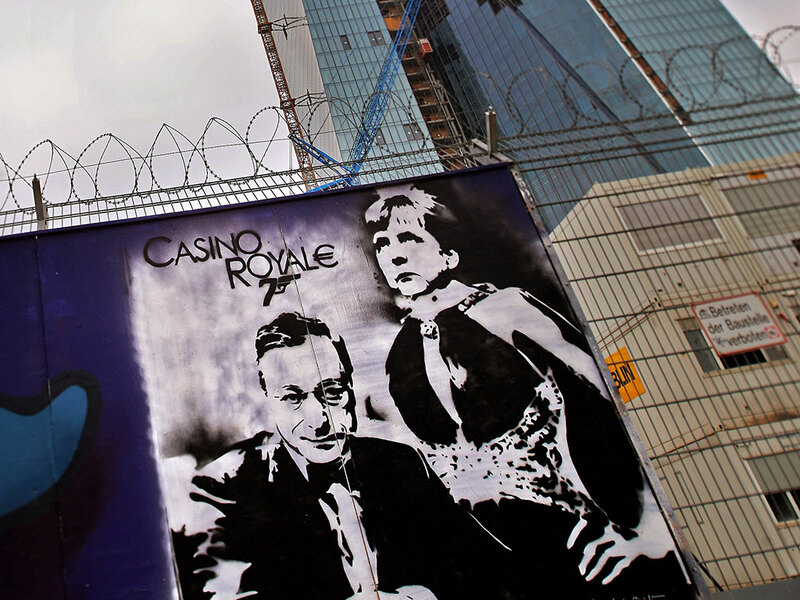 Despite the fact that some of the artwork is derogatory and depicts important political figures, such as Mario Draghi and Angela Merkel, the ECB has confirmed that it is happy for the artists to do their work and has in fact actively encouraged participation, supplying wooden panels and spray paints. 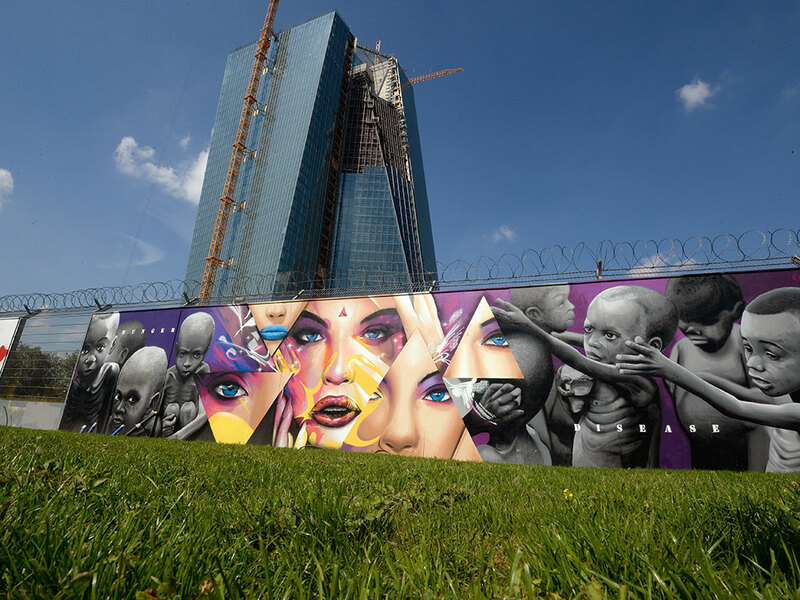 Banks and business have attempted to buy some of the works and some will even hang in the ECB headquarters upon its completion. 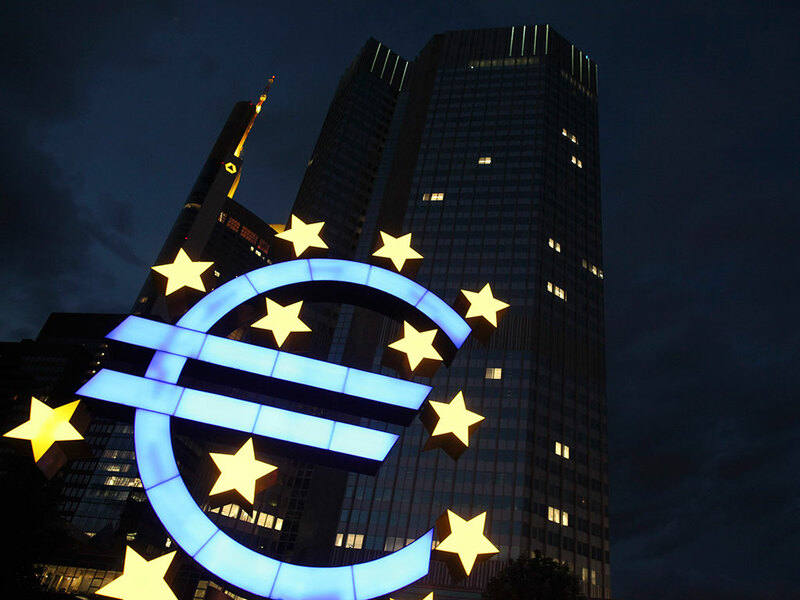 Is it time for the ECB to introduce a quantitative easing programme?